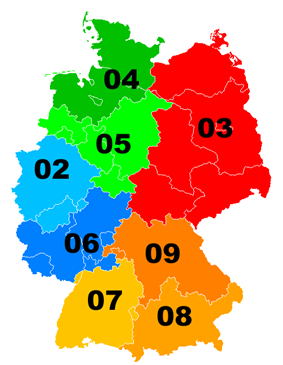 Area codes in Germany (German Vorwahl) have two to five digits, not counting the leading trunk access code 0. The leading 0 must be dialed when calling from within Germany and must be omitted when calling from abroad. When calling via fixed networks within the same area, the area code is not required. In general, shorter area codes are assigned to larger cities, and longer area codes to smaller towns. Private telephone numbers are usually inversely long: those in larger cities have seven or eight digits, while those in smaller towns may have as few as three or four digits. The first digit (after the leading zero) is determined by region: area codes beginning (0)2 are found in the west, those with (0)3 in the east, those with (0)4 in the north, those with (0)5 in the north central part, those with (0)6 in the south central part, those with (0)7 in the southwest, those with (0)8 in the south and the 9s are found in the southeast. (0)1 are special numbers such as mobile phones (015, 016, 017), shared cost service (0180), televoting numbers (013) and 010 for dial-around services. The former codes 0130 for free phone numbers and 0190 for premium-rate numbers are now moved to 0800 and 0900 to meet international standards. 0700 is used for personal national phone numbers. The 01 prefix is for special numbers, and is not tied to any particular geographic area.